Foreign Minister Chrystia Freeland speaks to the press while arriving for a meeting of NATO foreign ministers at the U.S. Department of State April 4, 2019, in Washington. Foreign Affairs Minister Chrystia Freeland says Canada will not reopen trade talks to satisfy the demands of congressional Democrats, putting further pressure on the ratification process of the U.S.-Mexico-Canada Agreement. President Donald Trump, meanwhile, is throwing another spanner in the works: He is threatening to levy tariffs on Mexican-made cars – despite having explicitly granted Mexico protection from U.S. auto tariffs in a deal last year – suggesting he does not care if such an action causes the USMCA to fail. These developments cast further uncertainty on an already shaky deal. The three countries agreed on USMCA, a renegotiation of the North American free-trade agreement (NAFTA), last year. But Congress must approve the pact for it to take effect. Speaking in Washington before a NATO ministerial meeting on Thursday, Ms. Freeland responded to House Speaker Nancy Pelosi’s assertion earlier this week that Democrats would ratify USMCA only if it were reopened to toughen labour and environmental rules and roll back pharmaceutical patent protections. Ms. Freeland said she agreed with Democratic efforts to strengthen protections for Mexican workers and unions. But she said the solution is for Mexico to comply with tougher labour standards already established in USMCA. Mexico has drafted legislation that would make it easier for workers to form unions and push their employers for better pay and working conditions, but the bill has not yet passed the Mexican Congress. Ms. Freeland also lobbied U.S. Secretary of State Mike Pompeo on Wednesday to lift steel and aluminum tariffs. Mr. Trump imposed the tariffs on Canada and Mexico last year to put pressure on them to reach the new trade deal. But even after USMCA negotiations ended, Mr. Trump refused to lift the levies, which were imposed under Section 232 of the Trade Expansion Act. 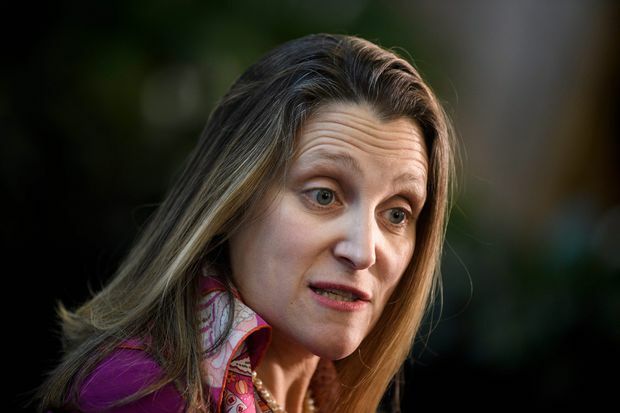 Ms. Freeland warned on Thursday that Canada might refuse to ratify USMCA if the tariffs are not lifted. However, Mr. Trump’s threat to Mexico on Thursday would add even more tariffs. The President gave Mexico a one-year deadline to cut off the flow of illicit drugs to the United States and stop all asylum seekers from reaching the border or face auto levies and the closing of the border. “We’re going to give them a one-year warning. And if the drugs don’t stop, or largely stop, we’re going to put tariffs on Mexico and products and particularly cars. The whole ballgame is cars. It’s the big ballgame with many countries. It’s cars. And if that doesn’t stop the drugs, we close the border,” he told reporters in the Oval Office. In side letters to USMCA last year, the United States agreed to exempt all Mexican and Canadian-made autos from any future Section 232 tariffs. Unlike the main text of the deal, the side letters came into effect immediately. Mr. Trump did not explain on Thursday how he would get around this. He acknowledged that his latest threat could complicate USMCA. “The USMCA is a great deal for everybody. But this is more important to me than the USMCA, so they’re going to have to live with it,” he said. Flavio Volpe, the head of Canada’s auto parts industry group, said auto tariffs are “an empty threat,” because Mexico would easily win a court challenge if the President tried to impose them. And he said that, if Mr. Trump actually tried to close to Mexican border, the economic consequences would be catastrophic for the United States. U.S. auto assembly plants rely on parts shipped from Mexico daily, meaning they would immediately grind to a halt.